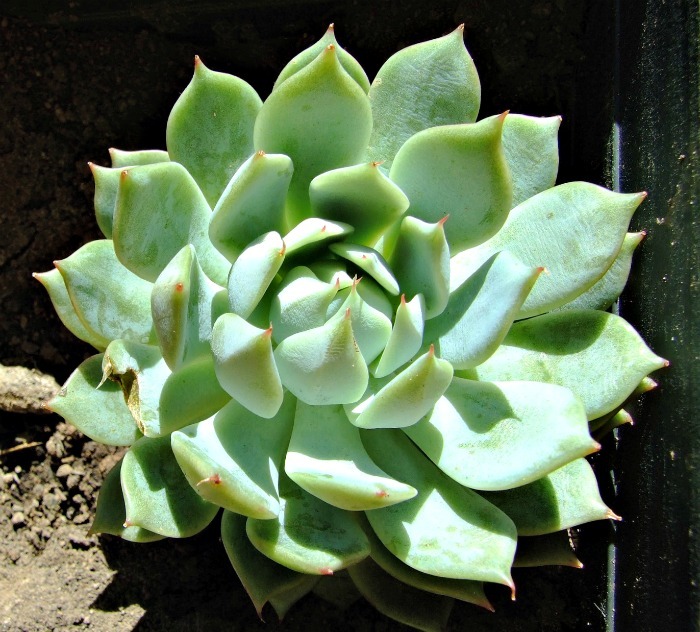 Caring for echeveria is a task made for those gardeners with brown thumbs. 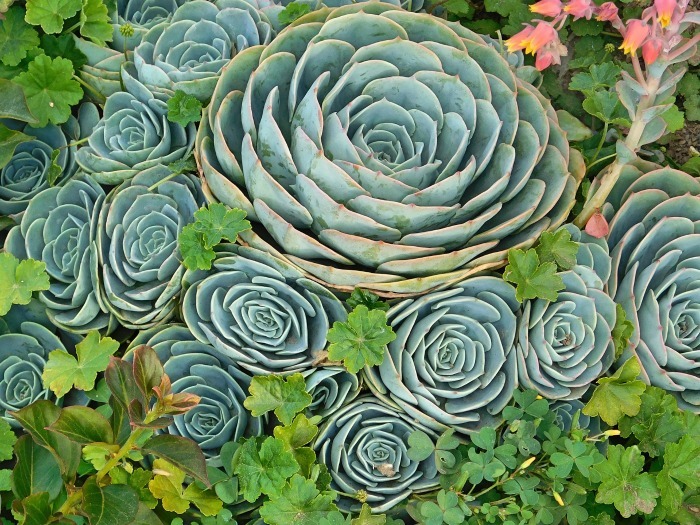 These rosette forming succulents have spectacular flowers that would make you think they need a lot of special care, but these plants actually thrive on a bit of neglect. 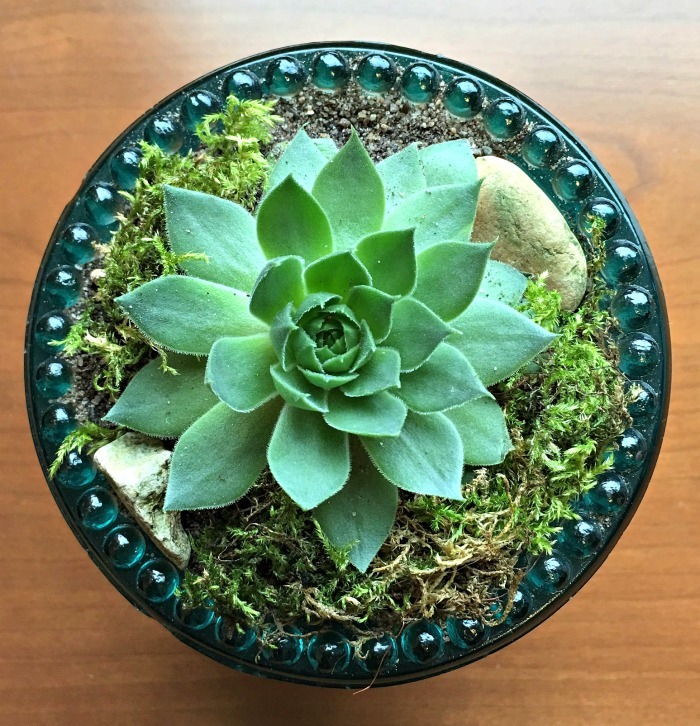 What is not to love about a succulent? These drought loving succulent plants are easy to grow, manageable in size and look great in all sorts of succulent planters, as well as outdoors in rock gardens if your hardiness zone permits. Echeveria (pronunciation: eh chev eria) is a native to the semi-desert areas of Mexico, Central America and the northwestern part of South America. They are a large genus of flowering succulents plants in the stonecrop family crassulaceae. 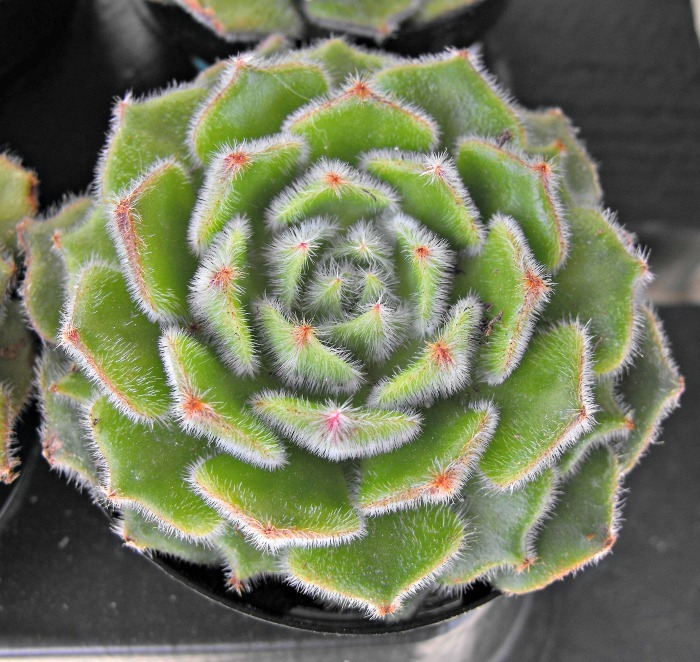 Echeveria varieties grow in rosette shapes and have pretty leaves that come in a variety of colors. And if you can manage to get one to flower, you are truly in for a delight. Very few plants look as nice in the home as a decor item. They are compact, pretty and very easy to grow. 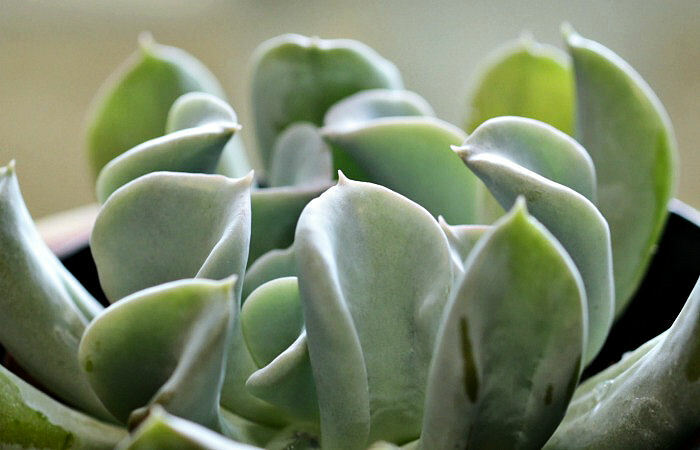 Echeveria are members of the Crassulacae family and their care is similar to sedum and kalanchoes. Most remain fairly small but there are some exceptions that will grow to a couple of feet. 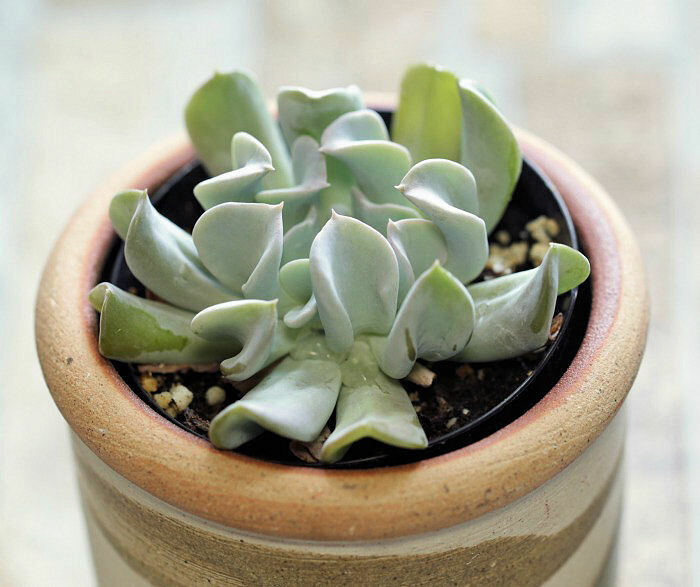 While the plant care needs vary from one species to another, these general requirements apply: To grow echeveria, keep an eye on the light, don’t over-water and make sure it’s not too cold. Like most succulents, echeveria love full sun outdoors and need a sunny window if you grow them as an indoor plant. In very hot climates, they may need some protection from full midday sun. When you bring the plant outdoors in the warm weather, try to acclimatize it to the sun by gradually giving it more and more sunlight each day. If you move it from indoors to outside and place it in full sun right away, it could scorch the leaves. A plant that gets the right amount of light will be a compact rosette. If your echeveria starts to stretch and grow into a tall, spindly plant, it means that the succulent is not getting enough light. The plants need water regularly during the spring and summer if you have them outside in the full sun. If you grow them in planters, be sure that there is very good drainage. A special cactus and succulent soil is perfect. Echeveria plants hate having wet feet. 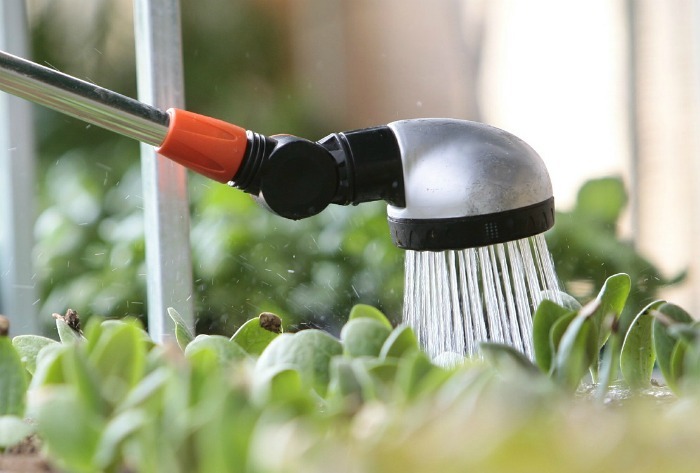 Be sure to cut back on watering during the winter months when the plants are more dormant. Outdoors, I give my succulents a good soaking and then let the soil dry out before I water them again. Depending on how hot your summer gets, this could mean every day. Trying to grow echeveria outside in the winter, here in NC, is a challenge. While I have heard that there are a few cold hardy echeveria, most will rot easily from excess water in the winter, and cannot take a freeze, so I must resort to growing echeveria indoors in the colder months. 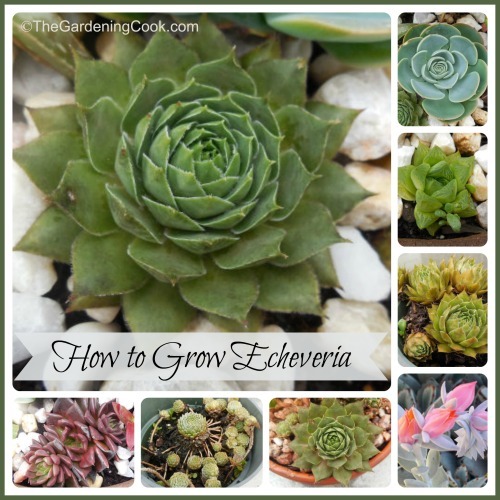 Echeveria prefers temps between 65º – 70ºF and do not like to go much below 50ºF. They are only hardy outside in higher temperature zones. Zone 9b is about as cold as they will stand in the winter. This contrasts with sempervivum, (hens and chicks) which are cold hardy to a much lower temperature. For that reason, unless you live in the very warmest zones, I recommend growing echeveria as a houseplant during the winter months, but bring them outside during the summer. As long as the last frost date has passed, it’s safe to bring the plants outdoors. They love a sunny spot in a rock garden! 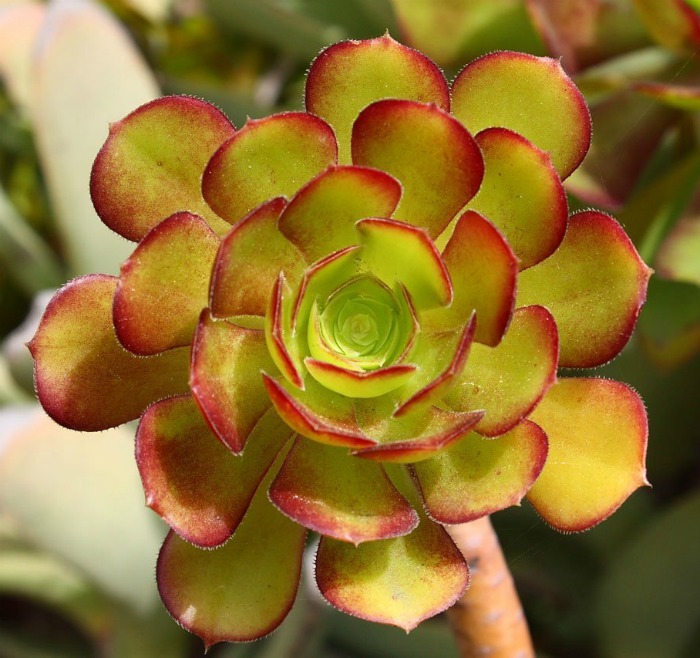 Succulents grow in nature in soil that often has very little nutrients so fertilizing is not really necessary. If you do fertilize, do so in the growing season and use a weak liquid solution. Natural organic matter such as compost adds to the soil and it can be used when you see the succulent starting to flower. Echeveria types have many different shaped leaf varieties. Some are smooth and pointed, and some have colorful margins. There are varieties with a fuzzy leaf texture and those with frilly edges. One characteristic that seems prevalent in all of the echeverias is that the leaves are somewhat chubby, since they store water in them. 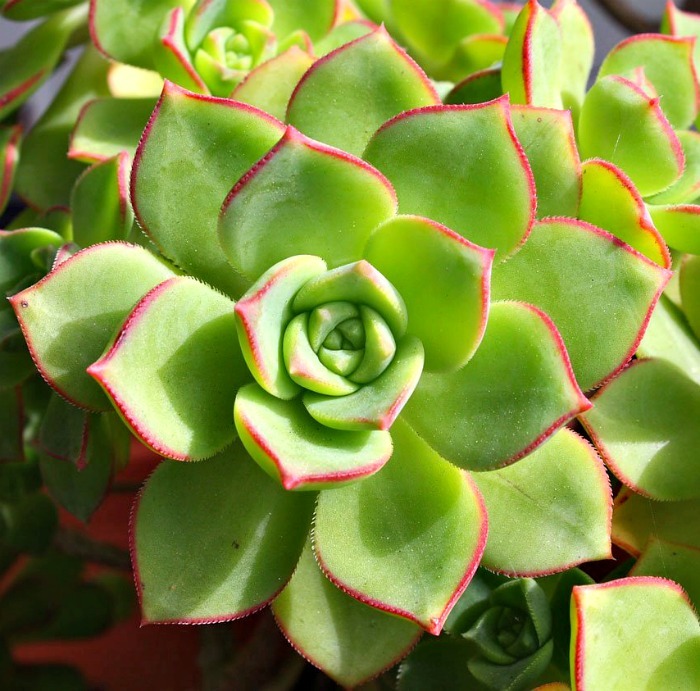 The leaves of most succulents can be used to propagate into new plants. Even damaged leaves might give you an opportunity for new babies! The echeveria bloom is showy and something to behold. Even though many gardeners grow echeveria for their chubby, rosette like shape and interesting textures, the flowers are even more spectacular! 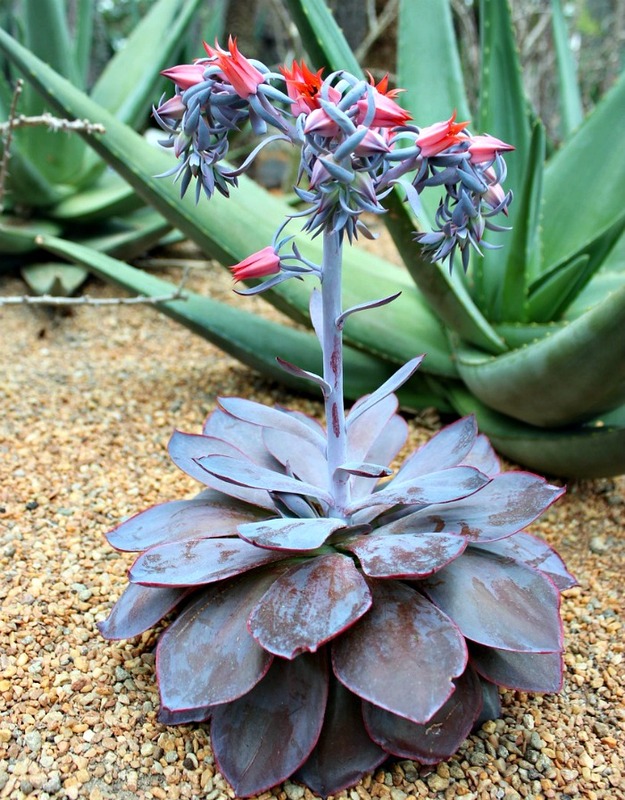 The flowers of this succulent are produced on long arching stalks. One plant may have several blooms that open, one after the other, giving you weeks of color. 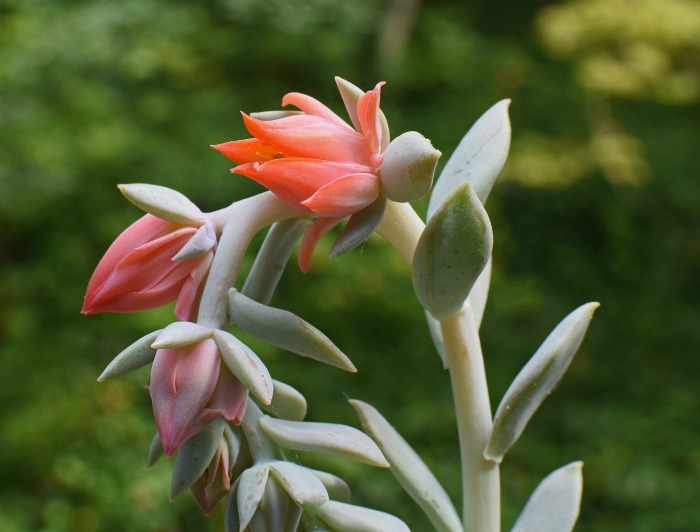 Echeveria flowers are not succulent and usually pink with thin, narrow, aster-like petals. Some have stems of flowers that can grow to about two feet long. 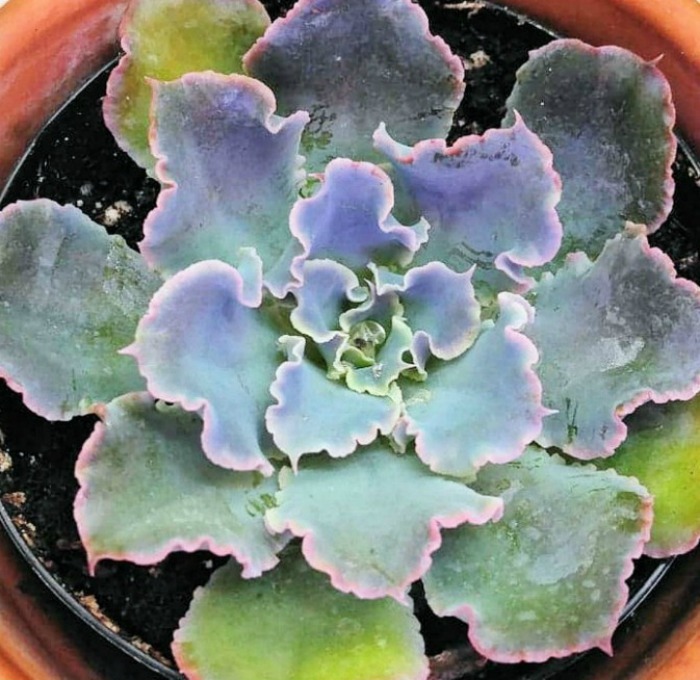 Echeveria are very easily propagated from leaf cuttings. Just allow a leaf to callous on the end and then place it in some perlite, sand or seed starting mix. You can either lay the leaf on the ground, or insert the tip. Both will work. 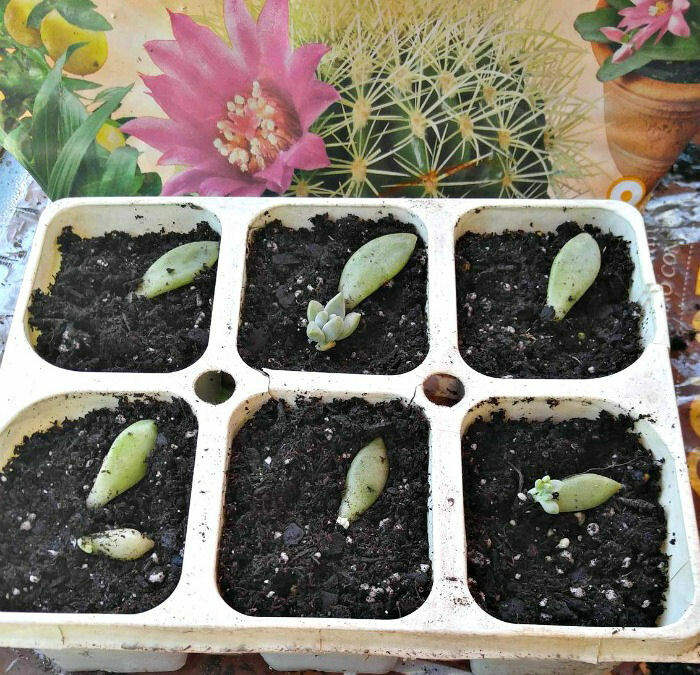 I have a whole tutorial for propagating succulents that shows how to do this. Before you know it, you will have new baby echeveria plants growing from the calloused end of the leaf! A single mature echeveria plant will also send out lots of babies. Each baby can be potted up into a new plant. It is easiest to do this if the baby already has roots, but those that don’t will soon grow them. These offsets are easy to separate and grow. 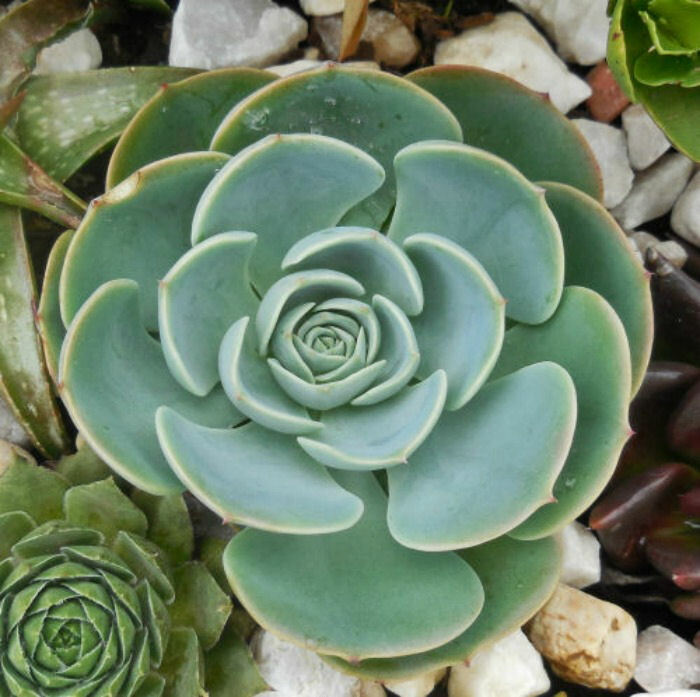 Just pull away the little baby rosette and replant in a cactus mixture or use equal parts sand, soil and compost as a potting medium. If your plant flowers and you are lucky, you may even get some seeds. If the flower produces seeds, just snip the whole flower stem off once the bloom time is done and place it in a paper bag to dry out. With a bit of luck you may get a chance try growing echeveria from seed, to get plants for free! Spring is a good time to re pot if needed. Let the plant dry out first and then gently remove from the pot. Remove any dead leaves from the base of the plant. Check the roots to see if the plant is pot bound. If it is, take off the old soil and any rotted or damaged leaves, or roots and treat with a fungicide. Re-pot in new potting mix, in a pot 1/3 larger than the one it was in, taking care to spread out the roots as you add the soil. Do not water for few weeks until it settles in and then resume watering as before. Most echeveria will lose their lower leaves in winter. This can mean that, after a few years, the plants will lose their attractive, compact appearance and will need to be re-rooted or propagated, even if they are not pot bound. Breeders are coming up with new varieties of them all the time with interesting new leaf forms and colors. Echeveria domingo. Has a lovely pale blue-gray rosettes shape, that is flushed pink at outer edges. Drought tolerant but not frost tolerant. Echeveria ciliata. Fuzzy plump rosette shape with dark red leaf tips. Mature plants send out numerous offsets. The leaves are broader lwith fewer bristles at the edges of the green leaves and more on the tips. Echeveria Neon breaker. Curly leafed variety with bright pink margins and a spectacular flower that grows to two feet long. See my tips for growing Echeveria Neon Breakers for a variety that will knock your socks off with their flowers. Aeonium ‘Kiwi’. Delicate apple green leaf color with bright red leaf margins. It has red flowers which have a yellow tip and it blooms in the spring. This plant is actually a member of the crassula family but the rosettes are very similar to echeveria. Echeveria Lola. This variety has pale green, plump leaves with very pointed red tips. Somewhat of a rosebud shape with leaves that resemble alabaster marble. Echeveria topsy turvy. This fast growing variety has spoon shaped leaves that are a powdery blue-gray color. The leaves are rolled in an interesting way downwards along the length of them and curled up at the ends. What has your experience been with Growing Echeverias? Have you been able to grow them outside in the winter months? Please leave your comments below. 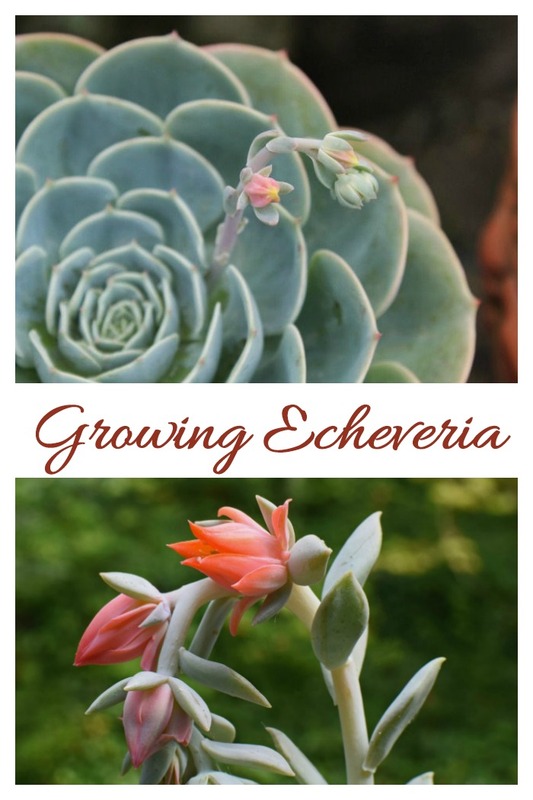 Admin note: This post about growing echeveria first appeared on the blog in October of 2013. I have updated the post to add more information on the care of echeveria and also added some new photos for identification as well as a video for you to enjoy. Would you like a reminder of this post? Just pin this image to one of your Succulent boards on Pinterest so that you can easily find it later. My neighbor has a ton of these in her yard and they survive MI winters! It’s not so much the cold, I understand, as it is the rain. They can’t stand being in wet soil, and that is what we have here in NC in the winter. Also, the larger and more established they are, the better they do. I have succulents that have been growing for over 40 years, every time I see a new kind I pinch a bit off it and bring it home and just put it in the ground with the rest they are so easy to grow. 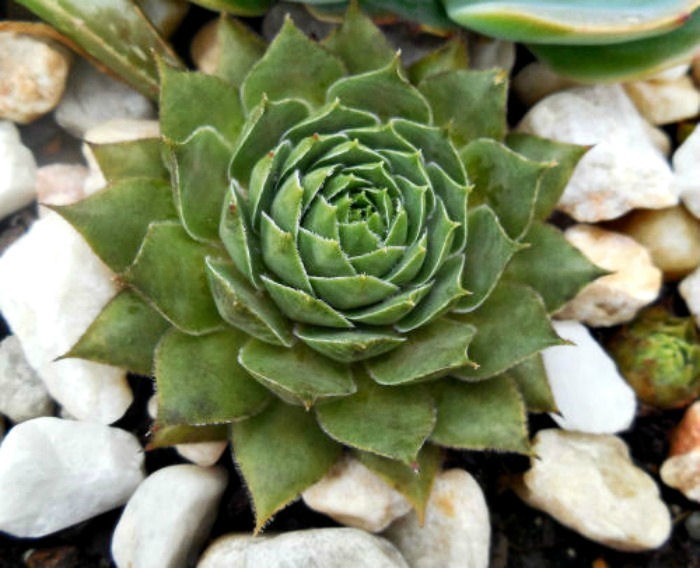 There is a huge difference between Echeveria and Sempervivum; Echeveria will not survive any cold – most are not hardy where there is even the slightest chance of frost. Sempervivum however, love the cold, and thrive in even Zone 3 or 4 (USDA). Guess which ones I like the best? Hmmm sempervivium? LOL. I need to get some. I lost most of my echeveria last year because I did not get them inside soon enough. Some of the plants that you’ve listed above are Sempervivum, not Echeveria. Sempervivum are hardy and will withstand my Zone 4a winters. Echeveria won’t. Echeveria ‘Black Prince’ looks a lot like Sempervivum! Thanks Jacki. Appreciate the comment and info. I need a recipe for whatever is white and sitting in all the crevices of my sempervivums, and the areas are soft. Don’t know what it is. I know I should never water them overhead, but sometimes it can’t be avoided. Anyone with advise. A Friend of mine gave me an echeveria, and I propagated them. 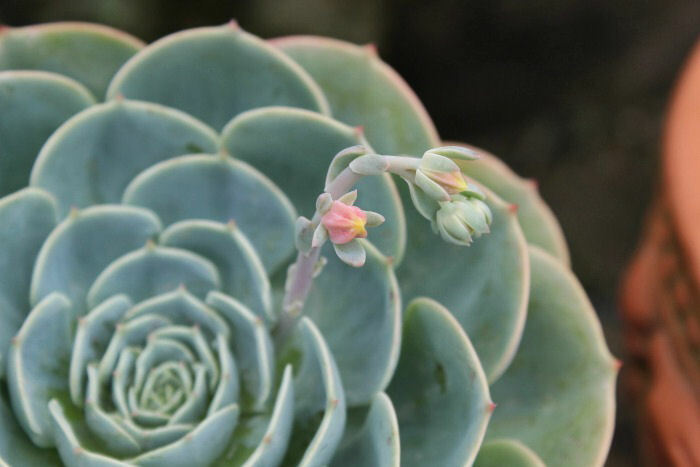 The mother Echeveria have few flowers that soon to bloom. I didn’t have any idea about this plant until We bought the Neon Echeveria. My Husband was attracted to its flowers so we bought it. Are the bottom leaves breaking off this plant intentional? Where do I cut top off and how do I dry out? Thanks for your reply Carol. Do you know what type this one I have is? It was an engagement present and I’ve been trying to figure out how to take care of it. Should I be trimming back these long shoots that don’t have any growth on them? Hi James. It looks a bit like Echeveria plush plant from the photo (if the leaves are sort of fuzzy.) Yes some of the shoots are leggy and they won’t grow leaves on the bottom part until you cut them off at some point…then the plant will push out some side shoots. That is the flower of an echeveria. Most of them have similar flower stems, but not necessarily in the heart shape. Usually the stem is one long droop, not the split top into the heart.